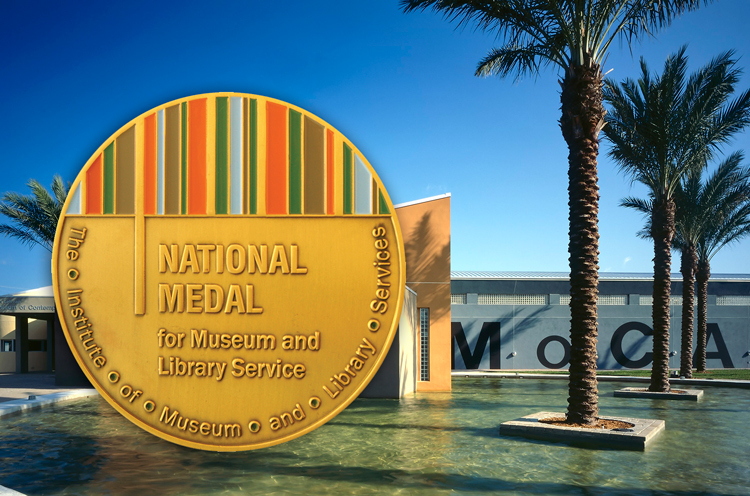 The Institute of Museum and Library Services today announced the Museum of Contemporary Art in North Miami, Fla. as one of 10 recipients of this year’s National Medal for Museum and Library Service. The nation’s highest honor conferred on museums and libraries for service to the community, the National Medal celebrates institutions that make a difference for individuals, families, and communities. The National Medal will be presented at a celebration in Washington, D.C. on November 14. The Museum of Contemporary Art, North Miami serves one of America’s most diverse areas through educational programming with goals of keeping students in school, improving literacy, empowering women, deterring unsocial behavior, and easing feelings of isolation through the universal language of art. Among its acclaimed outreach initiatives is Women on the Rise! – a program that serves teen girls in the community and trains local artists to go into such facilities as juvenile detention centers where it helps female detainees learn how to express themselves through art. Additional community art programs encourage children to take pride in their community. The museum’s innovative classes, workshops and seminars forge creativity and inspire students of all ages to become lifelong learners. Twenty-two-year-old Kassandra Timothe, who began volunteering at MOCA when she was in middle school and was enrolled in the museum’s teen programs, will travel to Washington with Ms. Clearwater and share the impact the Museum of Contemporary Art has had on her life during the November 14 celebration. This year’s honorees exemplify the nation’s great diversity of libraries and museums and include a school library, county library systems, individual libraries, children’s museums, an art museum, science centers, a park conservancy, and more, hailing from 10 different states. Medal winners are selected from nationwide nominations of institutions that demonstrate innovative approaches to public service, exceeding the expected levels of community outreach. For a complete list of 2012 recipients and to learn more about the 2012 National Medal winners, please visit www.imls.gov/medals. The Museum of Contemporary Art, North Miami (MOCA) unites people of all ages and backgrounds through its innovative exhibitions, renowned collection and education initiatives. The museum is internationally recognized as a force in defining new trends and directions in contemporary art. MOCA’s active calendar of events includes lectures by renowned artists and critics, film screenings, concerts, cutting edge performances, and highly original education and outreach programs. MOCA’s permanent collection reflects significant artistic developments in contemporary art by emerging and established artists from the U.S. and abroad. John Baldessari, Uta Barth, Jose Bedia, John Bock, Teresita Fernandez, Dan Flavin, Felix Gonzalez-Torres, Trenton Doyle Hancock, Pierre Huyghe, Alex Katz, Edward Kienholz, Mariko Mori, Dennis Oppenheim, Gabriel Orozco, Philippe Parreno, Raymond Pettibon, Matthew Ritchie, and Gary Simmons are among the artists whose works are included in MOCA’s permanent collection. Architectural plans for the expansion and renovation of MOCA’s current facility will more than double its overall space to 54,000 square feet and more than triple its current exhibition space to 23,150 square feet. The expansion’s concept plan is designed by Gwathmey Siegel Kaufman + Associates. The expansion will allow for ongoing access to MOCA’s permanent collection, provide an education wing for classes and public programs, expanded space to present concurrent exhibitions, new art storage and enhanced public areas.